I dont need to tell any of you how great Anthropologie is. While they have amazing things they tend to be kinda pricey BUT they also tend to have great sales. And by great sales I mean 40% off the lowest marked price...aka the Anthro Home Sale Event. Score. Of course as soon as I walked in I knew I would be giving my plastic a little work-out, even if it did not want it because its been sooo tired lately. 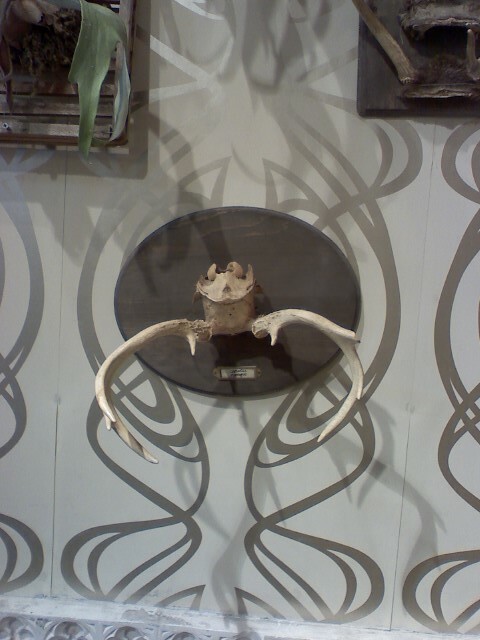 Antlers, these have been everywhere lately. I only like the animal friendly kind...I really hope these were from an animal who died of natural causes or was killed by another animal as food and not by a human. At least that's the story in my head. 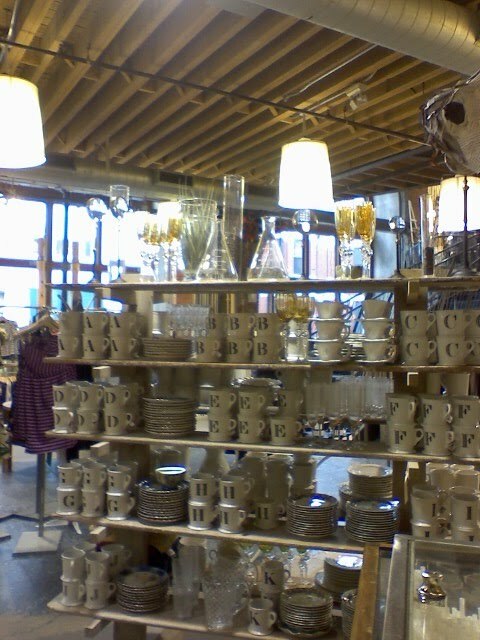 Can you see the glass beakers and Erlenmeyer flasks there too, up on the top shelf. Yea I love those too and want to curate a collection asap. Anyone looking for a statement piece in their family room? 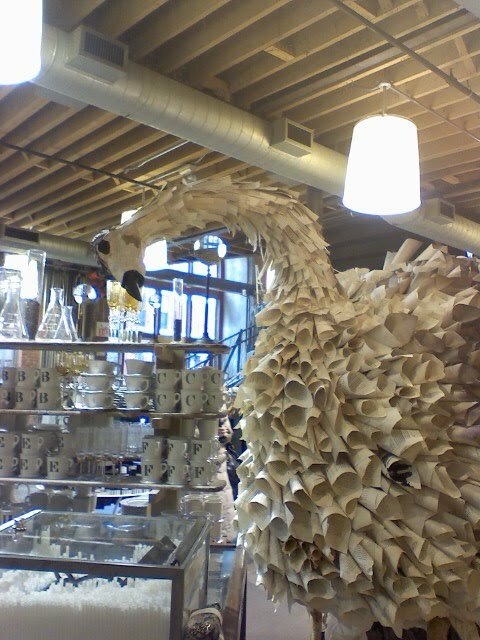 This swan/bird thing was made out of rolled paper is creepy cool...kinda the same technique that Christina from Full House did with her awesome sunburst mirror project. I like her kind of rolled paper better. 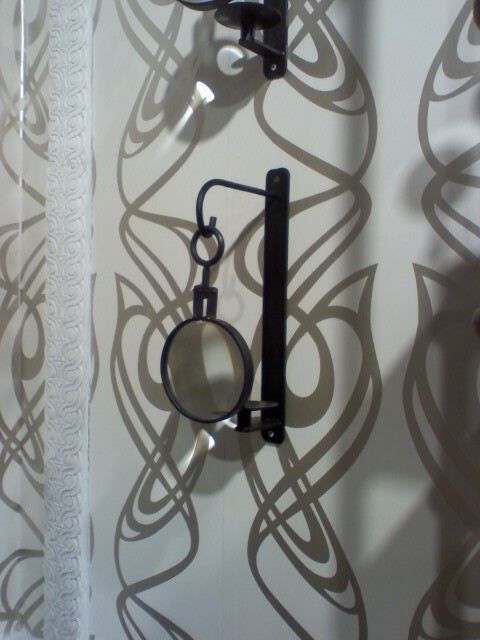 This magnifying sconce is fun, and at only $48 each a pair of them would be a great addition to any room. I wish I got them when I was there because I can't stop thinking about them now...don't you hate that feeling? So what did I come home with?? 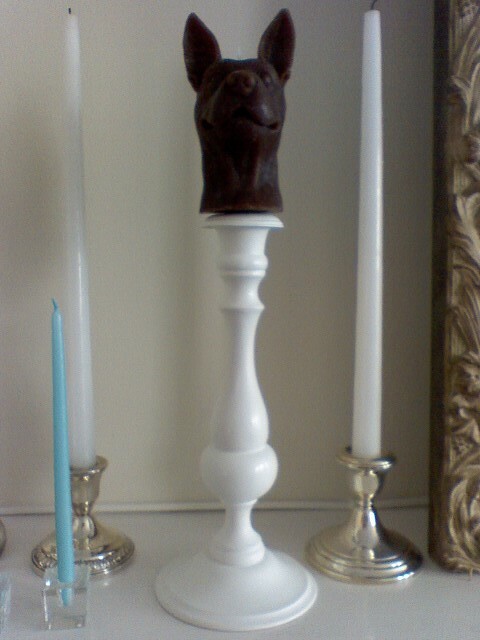 Two of these funky-so-ugly-they-are-really-cute dog head candle things at a whopping 85% off the original price. What good deals have you scored lately? Do share. I really haven't been shopping too much, but a recent trip to the fabric store had me saving $167 and spending $37. I haven't had any scores lately, maybe I need to head over to Anthro. I love the candles! I cannot step into Anthro, it is my favorite store! Great sale! I love the mirrors. No big finds of late, but would love to go to the sale. I am pathetic, but Anthro here is in a busy mall with terrible parking and sometimes- even for Anthro- I can't drag myself in there. Shame, shame. I saw those funny doggy candles over at Peacock Feathers and wondered where in the world she'd found them. I should've known! Glad you got such a steal! Perhaps I need to shimmy on over to Anthro...Haven't been there in quite a while. 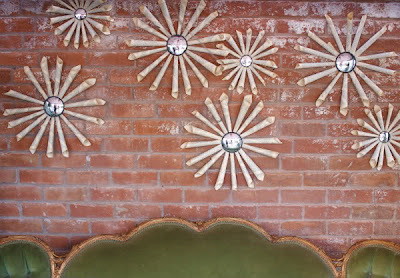 I did notice the big ostrich at Christmas though....that was fun to see that you posted the sunburst mirrors. I bet you made your plastic very happy. I'm so bummed I missed out! Love your pick up! oh I didn't know about the sale! My feet just might take a detour over to Boylston Street today...I LOVE all of Anthro linens and tableware! I love the idea that we all are more mindful about spending, less waste, etc. 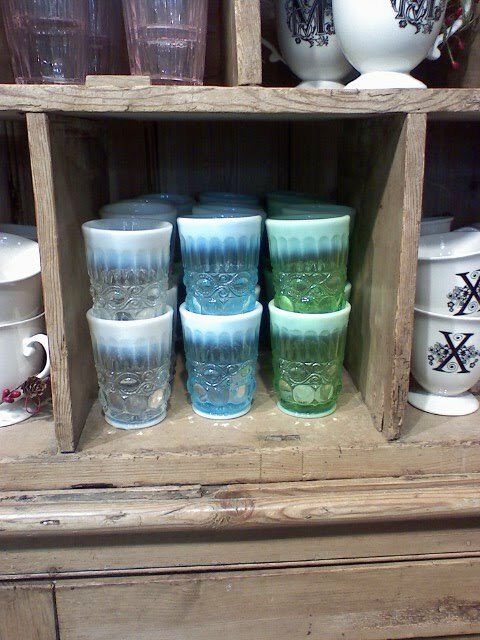 But, when I saw those initial mugs in Anthropologie for $6. I knew I was SAVING money on future token gifts - at least that is my story & I am sticking to it. LOVE THIS STORE...I CAN NEVER GO ALONE THOUGH AND BE THERE ALL DAY..I LOVE THE DOGGY..GREAT FIND AT 85% OFF. Amiable brief and this fill someone in on helped me alot in my college assignement. Say thank you you as your information. so much great stuff. they've had an incredible sale on their knobs online but, sadly, the ones that i bought (of course!) were not on sale. There are times when I pop into Anthro & pretend I live there, their decor is so divine. Until security gets called b/c I'm caught welcoming customers into my "humble abode". Ha! I adore the darling/funky/maybe-ugly-but-darn cute tchotcke!! Opulently I to but I contemplate the brief should secure more info then it has.